Ubiquiti’s UniFi Controller is an excellent way to deploy and manage home and SMB networks. If you have multiple networks (sites) to manage, having your UniFi controller hosted in the cloud is recommended for easy centralized control of your UniFi devices. Having UniFi in the cloud however poses some security risks and challenges that should be addressed as soon as the UniFi Controller is created. In this article, we will show how to secure UniFi from start to finish with best practices. We will be utilizing a server hosted on Digital Ocean, however these concepts will be similar on any hosted deployment. To create your hosted UniFi server, you will first need an account with Digital Ocean. If you do not have a Digital Ocean account, you can click the Digital Ocean logo below to sign up and receive $10.00 credit towards your first droplet (server). This essentially means you can get 2 months of the lowest tier droplet for free. The first step is to create your Digital Ocean droplet. From the Digital Ocean dashboard, click the green ‘Create’ button and select ‘Droplets.’ Under ‘Distributions,’ select Ubuntu 16.04.03 x64. (Version numbers may change over time, but you want a 64 bit version of a Ubuntu 16 server). Next, choose your Droplet size. If you are setting up UniFi for a small handful of sites, or if you are just playing around/testing, then the $5.00/month 1GB RAM /1 CPU Droplet size is perfectly fine. If, however you are going to be using this in production, I would recommend bumping up to the $10/month or $20/month droplet sizes. Next, scroll down and choose a data center. This can be any data center, but keep in mind that in general, the further away from you a data center is geographically, the higher the network latency will be. I typically choose the closest data center to my customer. In this case, I’m going to choose San Francisco 2. You can skip over the additional options and the SSH keys (we will be setting up SSH key authentication later), but you should set up a hostname. In my case, we’re going to use unifitest.crosstalksolutions.com. Click the green ‘Create’ button an your Droplet will be created. You will then be taken back to the dashboard where you can watch the Droplet creation progress. It only takes a few moments, and then you will receive an IP address for your Droplet. Since you now know your IP address, you should log into your DNS hosting provider or DNS server and create a new A record that points the hostname that you created in Step 1 to the IP address of your Digital Ocean Droplet. This will be needed in the future when we create the secure SSL certificate for the UniFi Controller. If you hover over your Droplet’s IP address anywhere in the Digital Ocean dashboard or server details, a little ‘copy’ link pops up that lets you very easily copy the IP address to your clipboard. Once your DNS A record has been created, you should be able to PING your hostname and receive the IP address of your Digital Ocean Droplet. At this point, you should have received an email from Digital Ocean which contains your Droplet’s IP address, username (which should be ‘root’) and password. Copy the password to your clipboard and then open up PuTTY. The very first thing that you will be asked to do is to change your password. First, you need to enter in your current password that you received in the Digital Ocean email (it should already be on your clipboard, so you can do SHIFT+INS again to paste it in). Then you will have to enter a new password twice. Make sure you choose a very secure password for your root user. *** NOTE: This next command commits these changes. If you lose connectivity because you made any mistakes, you should just destroy the droplet and start over. 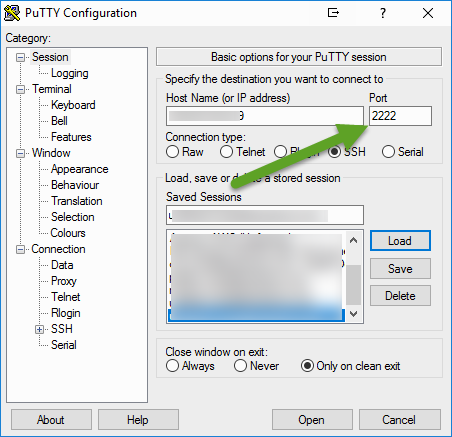 ALSO – keep this original PuTTY session open as you go through the next few steps…even after we restart SSH, this session will still be connected, so if you can’t connect in with the private key, you still have the opportunity to make changes. In the PuTTY window, enter the IP address or hostname of the server in the Host Name field. Now click ‘Open,’ and you should get a ‘Login as:’ prompt. Enter in the name of the user that you created in Part 4 and you should now connect to the server. If you have a passphrase on your private key pair, you will also be prompted for that passphrase. There are a few different ways to download and install UniFi, but for me, the easiest way to install and maintain the UniFi package is to use apt, so that is what we will do in our example. You should now have installed the latest stable version of UniFi, which is version 5.6.29 as of the writing of this article. Open a browser and connect to https://[server IP or FQDN]:8443. You will be prompted with a warning screen that is warning you the site may be unsafe. This is because we have not yet installed our secure SSL certificate. Click through the warning, or just type ‘badidea’ if you’re using Chrome to proceed. Note that sometimes, it can take up to 60 seconds before the setup wizard appears, so be patient. 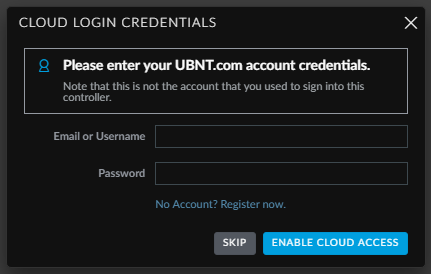 Once you proceed or skip the UniFi cloud access setup, you will be redirected to the UniFi login screen. Log in with the credentials that you created during the setup wizard. Finally, we are going to install a secure certificate on our UniFi server. The SSL certificates that I use for my systems are from NameCheap.com. Now – you can use any SSL Certificate provider for installing your SSL Certificates – the instructions should be similar. 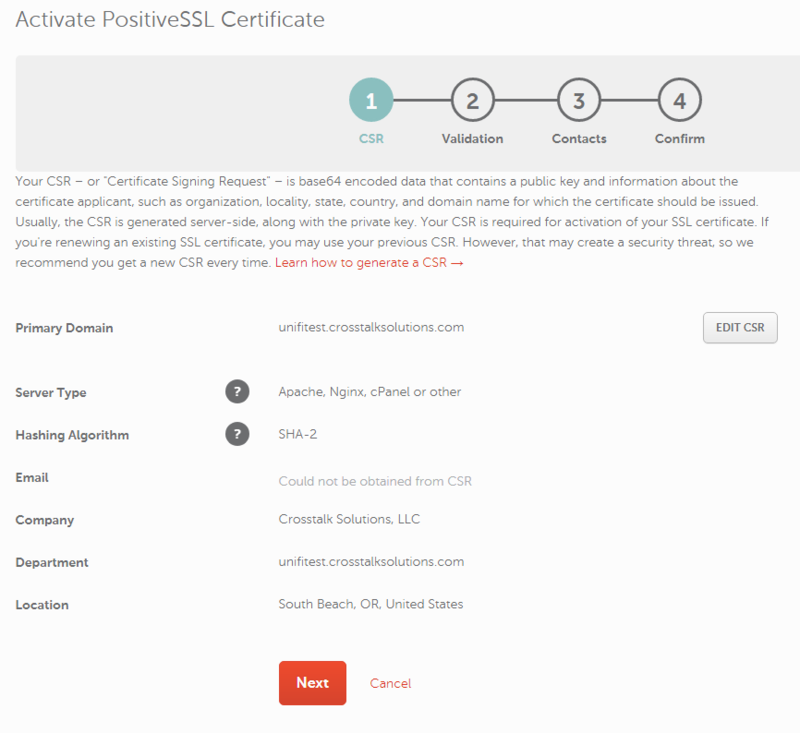 But, if you want to do exactly what I am doing in this example, please click the link below to get your Positive SSL certification from NameCheap.com. 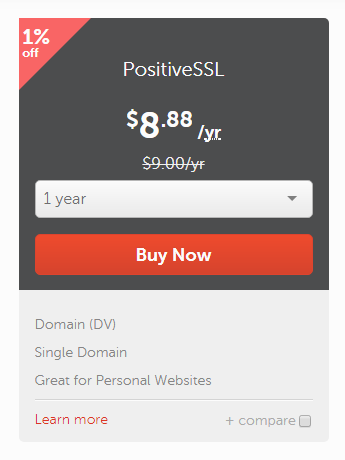 When you get to NameCheap.com, click on Security –> SSL Certificates. 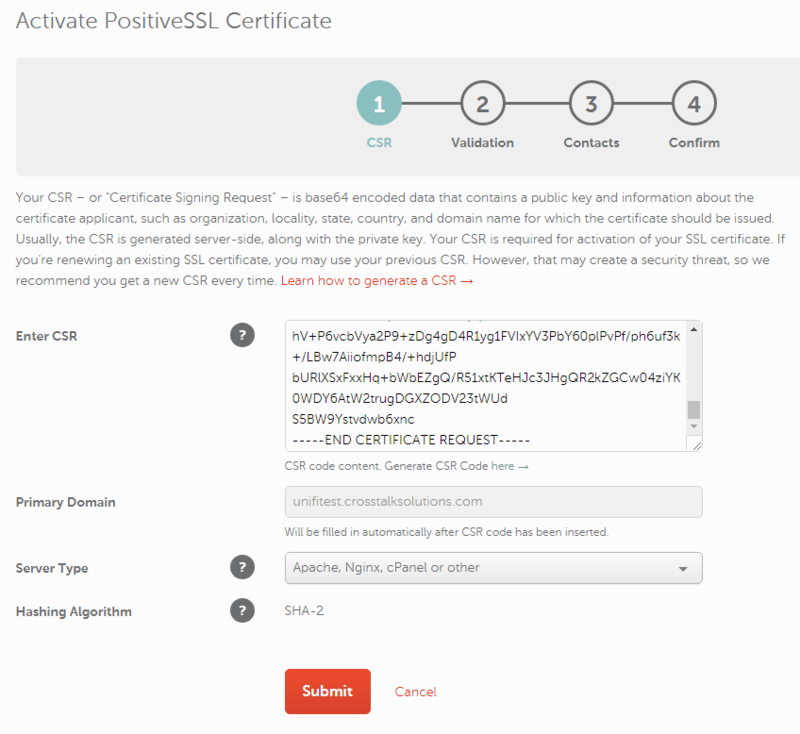 You don’t need any of the more expensive certificates for this – the $9.00 PositiveSSL certificate will work just fine. Click ‘Buy Now’ and add the certificate to the cart. Click ‘Confirm Order’ and complete the checkout process. When you go to the NameCheap dashboard, you will find your new certificate with an ‘Activate’ button. Click Activate to move to the next stage of the process. Select all of the text that was output and type CTRL+INS to copy. Click ‘Submit’ to move to the next step. You should receive a screen that shows you the company, city, state, and country code that you used when you created the CSR file. Click ‘Next’ to continue. Now we have a verification method – I find that email is the easiest verification method, but you can pick whichever one works best for your environment. Basically, what this means is that NameCheap has to verify that you own the domain (or have permission to purchase certs for the domain). In my case, I selected the Email method, and selected ‘info@crosstalksolutions.com’ which happens to be our support email address. Once you finish going through this certificate wizard (we’re on step 2 of 4), you will receive an email to the email address selected in the drop-down box. Inside that email will be a code and a link to click on – click the link and enter the code, and you’ll be verified. But – we still have a couple of more steps in the wizard. Click ‘Next’ to continue. In the next screen, we will enter in some company information – all information is optional except for Company Name, Address, City, State, and ZIP. Enter in all of that info, plus an administrative email address, and click ‘Next.’ On the final screen, you are given a summary to complete the wizard. 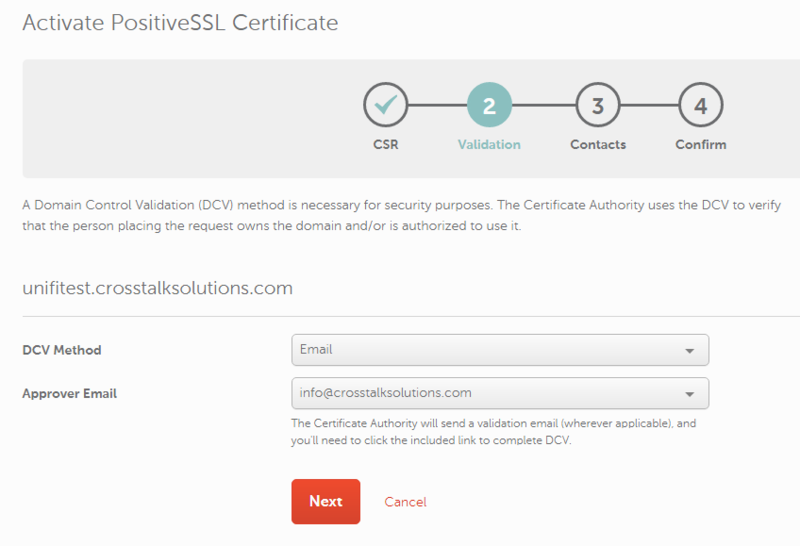 Once the wizard is complete, you will be sent the SSL Certificate Validation email with the link and validation code to get your certificate validated (that is, assuming you chose the email validation method). Once you have successfully validated, you can either log back into NameCheap.com and download your certificate file (see picture below), or you should also receive a copy in email. The file that you receive will be a .ZIP file named as the FQDN that you are using for UniFi separated with underscores. In my case, my certificate file came to me as unifitest_crosstalksolutions_com.zip. Unzip that file onto your computer, and inside, you will find 3 files – one .crt file, one .p7b file, and one ca-bundle file. We will be using the .crt file and the ca-bundle file to import into UniFi. The first thing we need to do however is get these files onto our UniFi server. To do this, we’re going to use WinSCP. 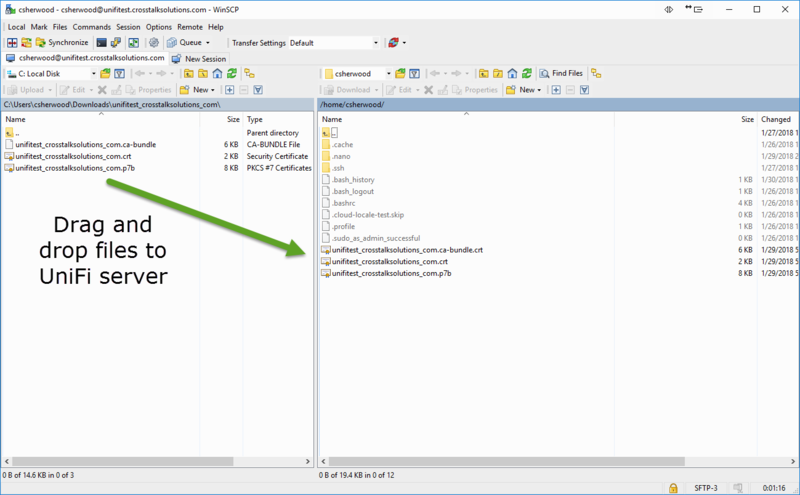 WinSCP is a free program that gives you a file explorer type of interface to other systems using SSH. Download and install WinSCP, and then create a new session for the UniFi server. Much like we did with PuTTY, we have to use port 2222, and we have to tell WinSCP where our .PPK private key file is. Next, click on ‘Advanced’ and click on SSH –> Authentication. In the ‘Private key file’ box, browse to the .ppk private file that we used to connect with PuTTY in Part 9. Click OK once the file has been selected. At this point, it is a good idea to save these settings in case you ever have to reconnect. 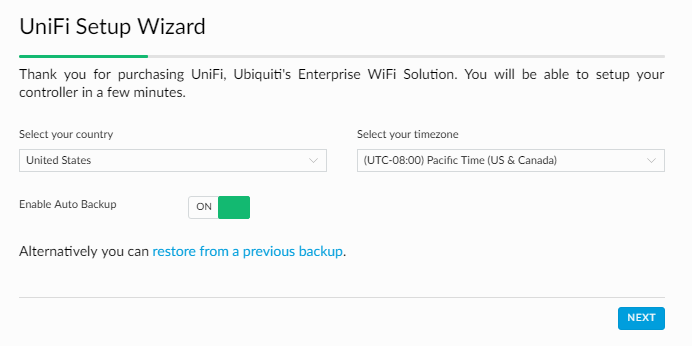 Once saved, click ‘Login’ and you will be connected to your UniFi server. It should put you directly into your user’s home directory, which is /home/unifiadmin in my case. On the left hand side of the screen, browse for the certificate files that you unzipped and then drag and drop them over to the right hand side of the screen. Now that our certificate files are on our UniFi server, we can close out WinSCP. Unifiadmin should be changed to the user that you created in step 4 (or wherever you put the certificate files). And the file names you enter should be your own certificate file names. You do want to keep them in this order however with the .crt file before the .ca-bundle file. Once the UniFi service has been restarted, you can now close out your UniFi browser window and re-open it – you should now see a green ‘Secure’ certificate lock in the upper left-hand corner of the screen. That’s it! At this point, your hosted UniFi Control is about as secure as it can get, while still allowing devices to be adopted from anywhere in the world. 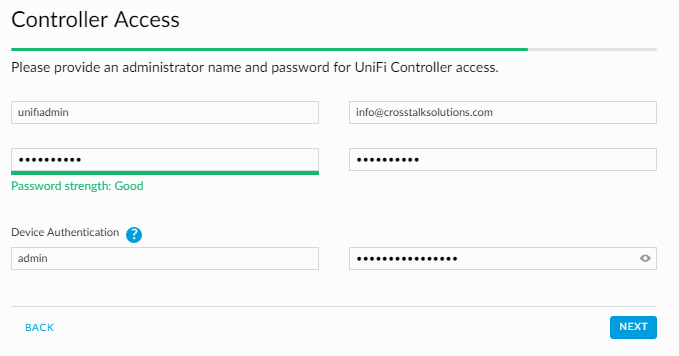 If you have any additional comments or questions, please comment below, and if you need UniFi setup assistance, contact Crosstalk Solutions at info@crosstalksolutions.com.